About Our Auto Repair Shop • E & L Service, Inc.
About E & L Service, Inc. Since 1974, E & L Service Inc. has provided motorists in the Lapeer area with comprehensive auto & truck repair and towing & recovery services. Our goal is to offer the best services available at affordable prices to get you back on the road in no time. You’ll be hard-pressed to find the same level of expertise that our auto mechanic specialists provide! We have years of experience working on both domestic and import vehicles of all makes and models and can work with you to find cost-effective repair and maintenance alternatives. For a high-performing vehicle, you can trust E & L Service Inc. with your car, truck, van, SUV, or fleet vehicle. Ron had worked for E & L Service off and on during breaks from classes at Ferris State University where Ron is a graduate of the Heavy Equipment Technology Course. In purchasing the business in 1991, Ron McDougall entered an agreement to purchase E & L Service Inc. and became the company President. Ron is a member of the Michigan Towing Association where he was an active Board of Director for over four years. Ron also is a Lapeer Optimist member as-well-as an Alumni of Delta Sigma Phi Fraternity, Delta Tau Chapter. In November of 2013 Marty Tompkins became a stock holder and Vice President of E & L Service Inc. Marty (tow truck) Tompkins is very well known in the community with having extensive experience in the towing industry since the late 1980’s. Marty is well versed in all aspects of towing from light duty towing to heavy duty towing and recovery work. Marty is a Wreckmaster certified operator and with his experience from farming, towing and trucking have proved to be a great asset to E & L Service Inc.
My name is Scooter and I have been coming to work @ E & L Service since I was a young pup. My duties are laying around the office, keeping my brother Turbo out of trouble and entertained. I get to visit the nice people that show up there all the time. Occasionally some nice dogs show up with those nice people and I get to smell them, “good times”. I am a Hunters Creek Club alumni having spent several weeks away at college getting trained. That’s what my Dad thinks it was, but don’t tell him that I just hung out with a bunch of other dogs my age until they took us in a big trailer out the fields to hunt birds. I loved it there except at nights I missed my Dad. My favorite things to do at work are bark when I hear a familiar voice so they will come visit me in my office and give me a treat. I also like it when we get to go outside and sniff all the cars on the lot and try to guess who’s car it is and where they came from. When no one is looking, I get to check for tire leaks while we are outside, I think some people call it multi-tasking if you pick up what I’m laying down. On my off time I love to hunt birds and retrieve them for my dad as long as he doesn’t miss them, sometimes he does and I just give him the look and move on to the next one. I also like to ride in the truck and see different people and places. The 3 of us go everywhere together and that’s the best times for me. I like it at E & L Service, everyone is nice and caring and they work really hard. I just wish they would work a little quieter when I am napping. 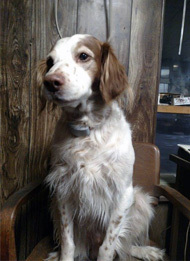 My name is Turbo and I have been working at E & L Service as long as I can remember. When I was very young I was loaded up in the back of a pickup truck with some of my brothers and sisters and taken for a ride it was so much fun and couldn’t be still. When I got to E & L they said I was wound up like a turbo “whatever that means”. I didn’t care, I just liked it at E & L and thought this place is great and I get to stay. That day I got a big brother named Scooter and I got a great name Turbo. Not sure he was as happy as I was but I thing I grew on him. I learned everything about the shop and office from him. He even took me to his college, Hunters Creek Club so I could learn how to hunt and behave like he did, Those were some good times. We hung out with lots of other dogs at college and he looked out for me as I grew up. We got to run, find birds and retrieve them. I like working at E & L Service, Somebody is always around to say Hi and give us treats, all we have to do is bark loud when we hear someone we Know and they come in my office to visit my brother Scooter and I. Scooter says we have an important job checking for tire leeks it keeps all the customers and the other workers safe on the road. I just like to run around and smell stuff and be the first dog in or out the door, just as long as I am first and fast like a turbo that’s me. On my free time I like to hunt birds, run in the fields, chase the squirrels in the yard, anything that involves running real fast. When we are hunting and they shoot a bird I like to be the first to find it but I let Scooter retrieve it back to Ron, that way I can be the first to find more birds. Beside I don’t like the feathers in my mouth as much as Scooter does, just don’t tell him that. I also like to cuddle and give hugs and kisses. Nice people come from all over to see the guys at E & L Service for expert repair service and professional towing. They work very hard to keep everyone happy and safe on the roads. I couldn’t imagine a better place to be and look forward to smelling you all. 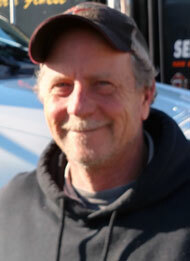 Darrell has been in the towing business since 2009 and can operate any type of towing equipment we have. 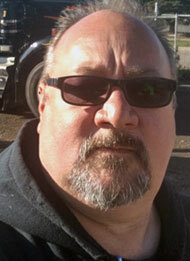 Darrell is very proficient in a flatbed and has worked his way into the heavy duty side of the towing business. 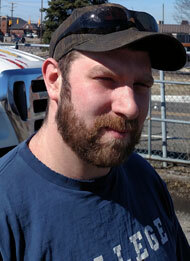 He is a Wreckmaster certified towing operator completing his level 2-3 course. 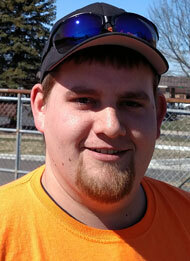 Darrell is a seasonal staff member primarily in the winter when things slow down from driving a gravel train. Darrell is a graduate of North Branch High School but has worked for some time in the Detroit Metropolitan area this has given him the opportunity to develop some very good driving skills both in the city and the country environments which makes him a very skilled all around driver. 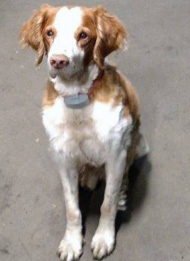 Darrell currently resides in the city of Lapeer with his dog Rubby. His family life is with his mother, father and 3 sisters. When Darrel is not working he likes to ride his Harley, go to the shooting range or lift weights. Brad is new to us this year 2017 and is another seasonal employee primarily as a light duty towing operator. Brad is a very experienced truck driver with years of experience operating semi trucks, gravel trains, tankers, equipment hauling and septic tanker hauling. Brad is another North Branch graduate who has worked in the metropolitan Detroit area for years. That type of driving experience brings much confidence in his abilities to E & L Service. He has learned the towing part of the job this winter and we are very happy with how well he has performed both with his equipment skills and people skills. He has received very high reviews from our customers consistently all winter long which is very good considering his limited towing experience. Brad comes from a big family with his mother, father, stepdad, 5 brothers and 2 sisters. To top that Brad is married with 8 children. It’s a miracle that he finds time for his hobbies like riding his Harley, power sports, hunting, eating and spending time with his family. Ronald was referred to us from Lapeer Team Work. He helps with shop clean up, washing tow trucks and general assistance for any lending hand he can provide on a part time basis. Ronald works on Tuesdays and Thursdays and enjoys being around the people and vehicles. Ronald is a people person who will strike up a conversation with anyone who comes through the door. Ronald is a big music fan and we enjoy asking him to name that tune or band and he is actually very knowledgeable. Ronald grew up and went to school in the North Branch Mi area where he currently resides in an adult foster care home. Ronald is 33 years old and has been in his residence since he was 18 years old. 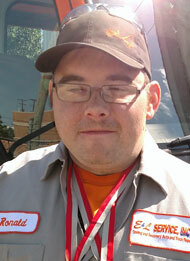 Ronald competes in the Michigan Special Olympics and currently a swimmer in several events. In the past he has also competed in snow shoeing and softball throwing. Ronald’s other hobbies are eating, watching Nascar Racing and traveling . Everyone enjoys having Ronald around he can bring the stress level down at times in a stressful environment.